Membership within the SOS Collective is open to all LGBTSTGNC people of color New Yorkers, especially those who live in Bed-Stuy, Crown Heights, Bushwick, and surrounding neighborhoods in Central Brooklyn. SOS meets every 1st, 3rd, and 4th Tuesdays of the month. We have open meetings every 4th Tuesday of the month. Although our meetings are not open to allies, we welcome the support of our non-LGBTSTGNC and white allies. Please contact Tasha Amezcua, the SOS Collective Coordinator at 718.596.0342 ext. 11 and sos@alp.org to learn how you can support our work. Safe Neighborhood Campaign: The S.O.S. Collective organizes and educates local businesses and community organizations on how to stop violence without relying on law enforcement. Want to become a Safe Space? Interested in recruiting more Safe Spaces? 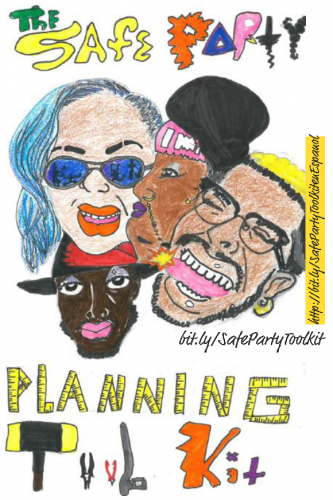 Join us in stopping violence one Safe Space at a time! Community Support: The S.O.S. Collective works to support LGBTSTGNC people of color survivors of police and hate violence in Central Brooklyn. From fundraising, to referrals, to outside of the system organizing strategies feel free to call on us for assistance. 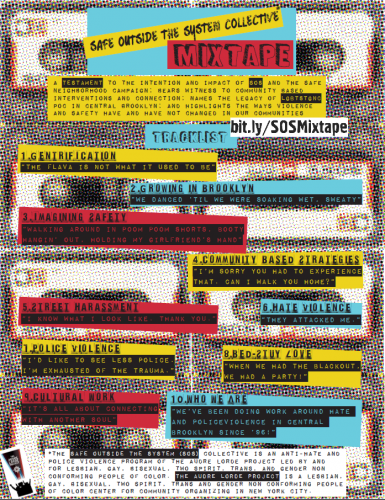 The Working Group on Police and State Violence (now SOS Collective) began in 1997 in response to a rash of street violence, repressive state violence tactics, an increase of police harassment, and brutality, and the “Quality of Life” policies of the Giuliani administration. In working to build a citywide movement, the WGPV participated in founding the Coalition Against Police Brutality (CAPB). With the other POC based organizations part of CAPB, the working group helped organized People’s Justice 2000, 41 days of action in the wake of Diallo and Louima, and annual Racial Justice Day (RJD) events, where the families of those who have been brutalized and killed at the hands of the NYPD raise their voices and demand justice. In our work, we have also taken on cases of community members, such as Jalea Lamot, a trans woman who, along with her family, was brutalized and arrested in her home by the NYCHA police. In addressing the broader issues of State Violence, we have collaborated with other POC organizations both citywide and nationally (TWW-Peace Action Coalition and Racial Justice 911, respectively) in response to post September 11th government policies and practices. We also held two War Against Terror Meetings, which worked to build and make visible an analysis of how homophobia and trans-phobia are cornerstones of the right wing agenda. And that this agenda is responsible for the repressive practices the “war on terror” and how LGBTSTGNC people are impacted on a daily basis. The WGPV also helped coordinate Operation Homeland Resistance, a civil disobedience after the invasion of Iraq, which connected oppressive tactics at home to imperialist war of aggression abroad.